This was a garage-sale find. 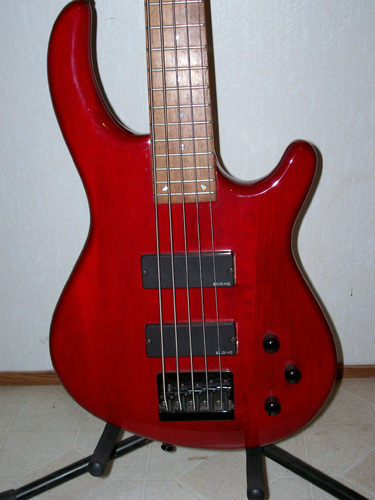 I’d always wanted to try out a bass, and there one was — great shape, low price, little bass amp and gig bag included. It came home with me. 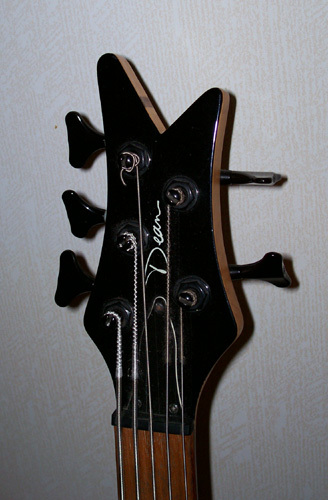 This is a very nice instrument, and I really liked the transparent red finish. But I just couldn’t get the hang of that extra string down there with the low notes. If I were to just jam free-form — by myself, with no other music except percussion — I could do okay. But ask me to play in a certain key and I was lost. Maybe it was just a matter of taking more time and getting used to it. But after awhile, I just figured it was time for him to move on to someone who knew what they were doing. One of these days, I’ll get another bass… but it’s definitely going to be the 4-string variety.